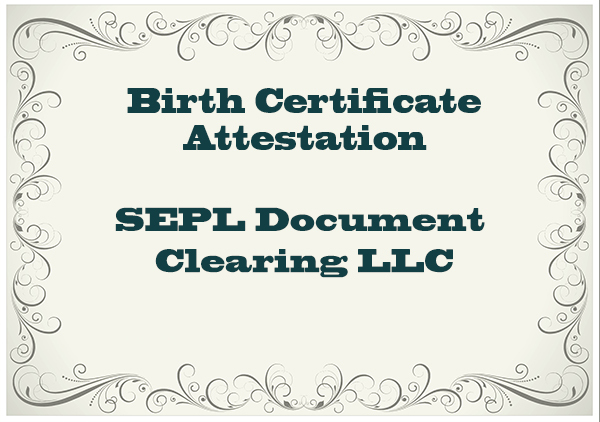 SEPL Document Clearing LLC is a leading company in offering services for all the countries Birth Certificates Attestation for UAE. Birth Certificate Attestation in UAE is the act of witnessing a birth certificate by official authorized person or Departments with their certified seal and signature. Birth Certificate Attestation is done in various circumstances when a child needs to be taken abroad along with parents to get educated or for any other purpose. Here we understand the importance of birth certificates and we take care of all responsibility and deliver your documents in safe hand with affordable and flexible rate. The Official authorized department attestation with its seal and signature also confirms that, the particular birth certificate is issued by that mentioned department and Seal and signature on that specified birth certificate is genuine. SEPL attestation group is serving its client of Attestation since many years. Birth certificate attestation is common practice in UAE to obtain residence visa to your baby or child. With Birth Certificate Attestation in Dubai services, we offer wide range of certificate attestation services for India, UK, USA, Australia, Canada, UAE documents. Birth certificate should be attested from issued country or state where child birth took place. For using the Birth Certificate in UAE, certificate should be attested from the Home department of the concerned country & corresponding Embassy of the country to which the certificate holder plans to go. SEPL Group can complete all the process as a package for you. How to get Birth Certificate Attestation processed from India? Delivery systems we have which is entirely free of cost at your home or office door upon completion. How to get Birth Certificate Attestation for UAE from, UK, USA Australia, and Canada? Initially, we have to get original Birth Certificates from where birth took place and then it has to be submitted for particular native country Attestation process. If the certificates are attested for UAE then it has to be attested by UAE Embassy in that country followed by Ministry Of Foreign Affairs, UAE Attestation. Yes, Birth certificate is an official record of the date and place of a person's birth, usually including the names of the parents. Attestation on Birth Certificate is needed for applying for a Family Visa. Attestation of Birth Certificates from India is required for getting the Visa from Gulf Countries also like UAE, Qatar, Oman, Kuwait, Saudi, etc.